This is a tough one, but hopefully you got the answer right. 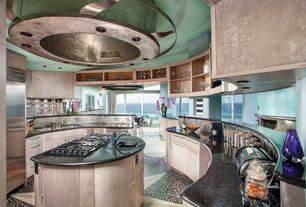 Unless you like to walk around in circles, the design of this kitchen is not only difficult but also BAD Feng Shui. For starters, the perfect formation in Feng Shui is a SQUARE or rectangle. Kitchens located in the center of a home radiate and circulate toxic fumes, odors, and sha chi NOISE throughout a house as well. The sound of pots, pans, dishes, silverware and glassware, along with the buzz of dishwashers, refrigerators and garbage disposals ALL create TOXIC NOISE – making conversation in the adjoining areas difficult. It also robs the home of peace and tranquility, which are important aspects of GOOD Feng Shui. In addition, the kitchen above is OVER DOMINANT in the WOOD element, and the FIRE element is absent altogether. The misuse of the “five Chinese elements” – energetically throws the environment and the people living in the environment – OUT OF BALANCE. In terms of Feng Shui – the design, location, and décor of this kitchen environment warrants a “D,” at best. BE AWARE THAT WHAT APPEARS BEAUTIFUL AND/OR AMAZING, MAY NOT NECESSARILY BE … HEALTHY OR GOOD FENG SHUI..!